Italian and Spanish term for sauce is called SALSA and in English-speaking countries, it usually is referred as sauces used as dips typical of Mexican cuisine. This authentic Vegan Mexican salsa sauce recipe will definitely make your next family or friend gathering a big hit and will certainly leave people wanting for more. Whether you throw a party or simply make some Mexican salsa for your own consumption, this recipe of salsa sauce combines a very perfect blend of spices which results in a wonderful dining experience. It definitely took me sometime, but I ultimately found a supreme recipe for restaurant style Mexican salsa which I could now prepare at home. I’ve been preparing this Salsa recipe for over a few years, and it has definitely become one of my favourite recipes, ever. So, what are you waiting for? Put your chef hat on and follow the video recipe instructions below. Combine the diced tomatoes, cilantro, onions, garlic, jalapeno, pepper, salt, sugar, chilli and lime juice in a blender. Pulse until you get the salsa to the consistency you would like. 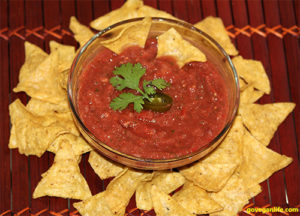 Serve the Salsa Sauce with Tortilla Chips.